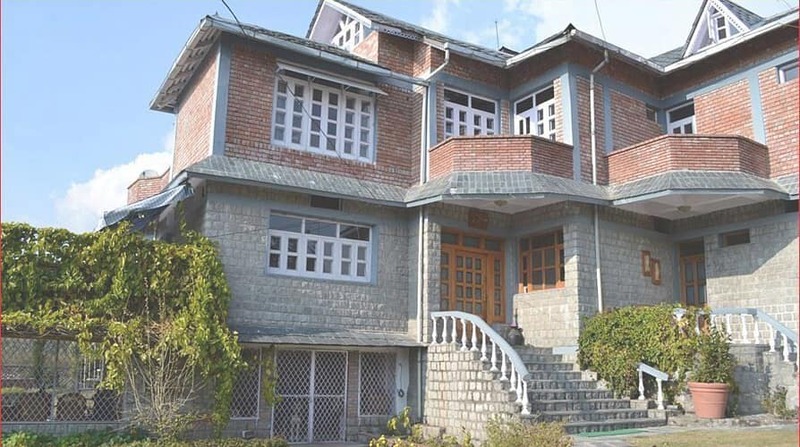 Navek-La is a heritage-style country home on the outskirts of Dharamsala in North India. The property is located just 11km away from bus stand. The Spa at this hotel features traditional treatment. The property has total 5 well appointed and furnished rooms for accommodation. Each room has attached bathroom facility. The other amenities provided in rooms are writing desk wardrobe and fire place in room.The beautiful garden is there in front of the homestay. There is a parking area for guests to park their private vehicles. Laundry facility is also available in hotel.Navek-La Homestay is situated at a distance of 15km from Dharamshala. It is within the reach of Kangra Valley (25km), Dal Lake (17km) and Bhagsu waterfall (19km). This homestay offers a comfortable accommodation in city. Navek-La Country Home, where we spent two nights in March 2017, was a great introduction to the comforts of a homestay. The main pleasure of the stay for us was meeting and chatting with the owners, Brigadier Sandhu and his lovely, gracious wife. We had a delicious homestyle dinner with them one night and had our two breakfasts with them, as well as tea on the patio on the evening of our arrival. We had very wide-ranging discussions about politics, history, and religion, especially with respect to India and Sikhism. They were very, very hospitable to us. The second night we were there my partner wasnt feeling well so Mrs. Sandhu sent up some kitcheree, a dal and rice dish that is Indias analogue to chicken soup in terms of helping one to feel better. (It worked.) The grounds are extensive and well looked-after. The owners are master gardeners and landscapers, so if you have similar interests you will have much to talk about. They also have three dogs that were very entertaining and keep a cow, which had a calf. Im not sure how many rooms are available. Ours was a large, well-appointed unit with a loft that could be used for additional family members. There are wonderful views of the Himalayas from one side of the room. Two things to note: (1) we accessed the room from an exterior spiral (lighthouse) ladder, which wouldnt work well for someone who wasnt very ambulatory. There may be another way to reach the top floor, but I didnt see one. (2) The hot water heater for the bathroom is on the small side. I almost drained it the first time I showered, and my partner then ran out of hot water in mid-hair-washing. After that we timed and staggered our showers, and all was well. You will probably need to do the same. A note about Dharamsala: if you want to focus your time on the Dalai Lamas temple and residence, I would suggest staying in McLeod Ganj. The drive from Navek-La to McLeod Ganj takes about 30 minutes over winding roads. Staying in McLeod Ganj would give you more of an opportunity to absorb the Tibetan Buddhist scene at your leisure. Navek La is a charming country home. The property showcases nature at its best due entirely to the efforts of the green thumbed owners... A garden burgeoning with flowers, vegetables, herbs and a vast variety of fruit.. It is a delight to experience. The rooms are large, airy and aesthetically furnished with attention given to all modern amenities.. Comfortable mattresses and pillows, clean crisp linen, invigorating showers et al. Special attention is given to dietary restrictions and preferences and the food is freshly prepared incorporating produce from the garden and lovingly served. Brig. And Mrs. Sandhu started off as strangers and ended up as family! From arranging transportation to giving us a bagful of freshly picked kiwis to take home, they spared no effort to ensure that we had a comfortable, enjoyable stay and returned home with happy memories. A Holiday to cherish and remember !! We loved this place in Dharamsala, we loved the folks running it, we loved the food, and the joy with which we were fed. We were travelling with two kids under five and could get home made food for our toddler. We had a great time at the home-stay and loved the graciousness of Mr and Mrs Singh. Navek-La is a beautiful homestay in the Rakkar Village near Dharamsala. It is run lovingly by Mrs and Brig Sandhu who go all out to make their guests feel at home. The rooms are spacious, well-maintained and aesthetically done up. The bathrooms are complete with amenities. The beds had impeccably crisp white linen and the mattresses were wonderful. I have not had better sleep outside of home. The food is to-die for. Each meal is a huge spread with each item on the menu being thought of very carefully by Mrs Sandhu. We were treated to local Himachali dishes, well-cooked non-vegetarian preparations and an array of pickles, fruits, preseves and salad greens made from produce from the garden. The company of the Sandhus adds to the liveliness of the meals. I must put down that my daughter not being too well one day, the kitchen catered to a special meal for her at short notice. The grounds of the homestay are large. Enough places to sit out and take in the glorious views. We were fortunate to make acquaintance of Simran, the artist daughter of the Sandhus. Conversations flowed ceaselessly and effortlessly which added so much value to our trip. It was Simran who had also kept up correspondence while we were arranging for our stay. The Norbulingka Institute is a short and beautiful walk away. The stream flows near the homestay and it is bliss to walk down and sit on the rocks and dip your feet. McLeodganj and Dharamsala are short cab drives away and the Sandhus can arrange good cabs. I would not hesitate to go back to Navek-La at the next given chance. If you go with kids or as families ask for the room with attics for those willing to climb up, they will work out cheaper.. The second floor rooms were gorgeous - can't speak to the first floor rooms. You can have top floor room to have better view. Take the ground floor rooms if you're with infants or toddlers OR people with knee problems. Else the views from the first floor rooms are superb and the attics of the first floor rooms are simply magical for kids under 10 years of age.